To me, the most majestic of all birds found in Manipal. It is endemic to the Indian subcontinent and is listed as “near threatened” as per IUCN and the population is considered to be on a decline. Alas! The latter is definitely true for Manipal, where I have seen trees on which these birds were previously sighted being brought down for “development” reasons. The total population along the W.Ghats is estimated to be around 700-800 birds, and Manipal can claim to hold at ~5% of that population! The Malabar Pied Hornbill is a massive bird, almost a meter long from beak to tail and with a wingspan of nearly 2 meters. To see one is a sight to behold, small branches literally break off as they are unable to support the weight of the bird. In flight, the huge wings make a whirring helicopter like sound each time they flap. Manipal, in my estimate currently holds a population of about 40 of these birds in peak season. The population is entirely reliant on the welfare of old forests with massive tree species such as fig (Banyan and Peepal, for example). The rapid deforestation rates in the region, a recent example being the Udupi valley (next to Syndicate Circle), where a few of these birds would occasionally be seen has ensured that breeding populations now struggle to survive in very small restricted areas – which still support these old forests and are devoid of too much disturbance. The valley behind the MIT hostels (under massive threat from college authorities and construction mafia) and the area around Alevoor Road and TAPMI campus are now the only two locations where these birds are regularly spotted. It seems they almost completely move out of the area from November to January, but breeding activity is visible from February onwards with a few pairs reappearing. I am aware of a couple of nesting sites as per this season, and another as per the last (but one that hasn’t turned up any birds this year yet). The nesting sites this season have already seen mass deforestation around them, with an entire hillside cleared of forests and the construction on these lands has already begun, The locals are well aware of these amazing birds and a few have told me how they love to watch these giants of the air fly around. 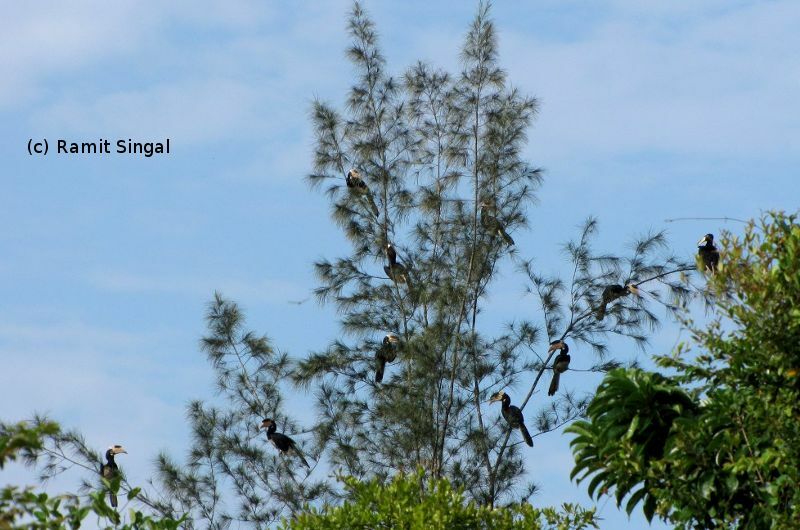 Awareness about his brilliant bird’s presence in the area is essential as they epitomize the biodiversity of the region. It is a bird of conservation importance, and the key to its survival lies in protecting its habitat. To see this bird in its full glory is a moment any birdwatcher and nature lover will certainly cherish for a lifetime. The Malabar Pied Hornbill could well be a flagship species for the start of wildlife conservation in Manipal – a town ravaged of late by meaningless and rampant construction and deforestation, and in need of reasons to save its natural resources.